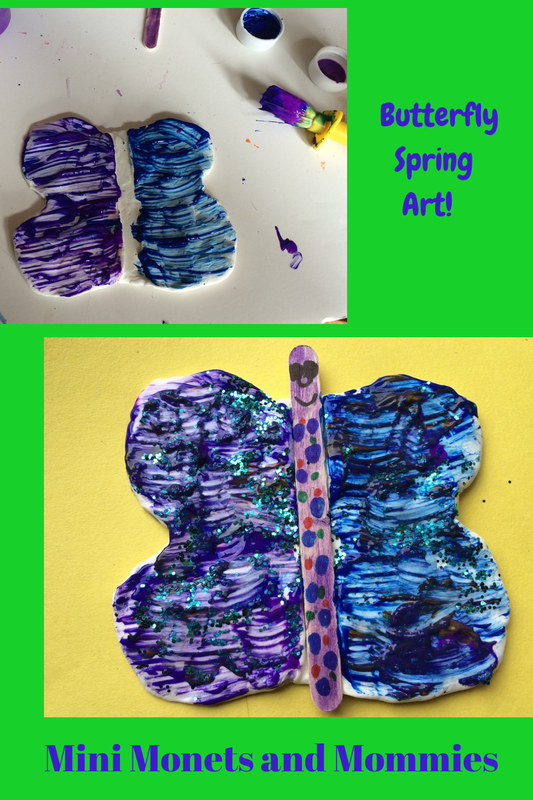 Today’s spring weather inspired me to create butterfly art. I’m sort of a Model Magic junkie, so I look for any excuse to use this soft air-dry clay-like compound. The fact that I could get away with adding glitter to this art activity made it all the better. 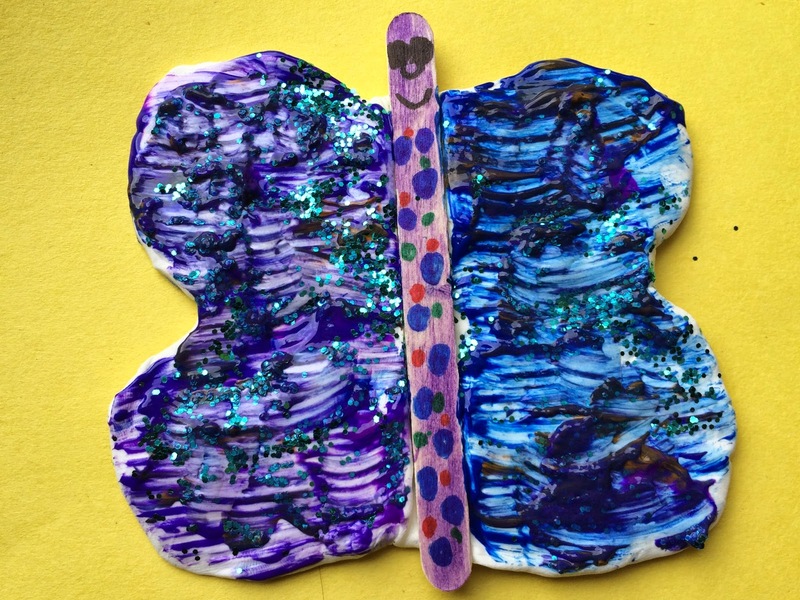 Your mini Monet can glue her finished butterfly art to a piece of poster board (making a relief sculpture type of artwork), make a few and hang them with yarn in a mobile, add teeny tiny versions to an unfinished wood picture frame or add a magnetic strip to the back to make a fridge magnet. · Model Magic – Even though you can buy ready-made colors, get the plain white stuff. Your child will paint it later, making it her own color! · Cardboard – Cut apart a box (I used the front of a cereal box). 1. Draw a butterfly outline on a piece of cardboard. Size the outline to approximately as big as an adult’s hand. Your child can make it smaller if she wants. If she’s struggling to draw the butterfly, help her to write one uppercase letter B, and then connect another backwards B to the back. Remind her that B is for butterfly, adding in some letter learning. 2. Cut the butterfly out. 3. Pull pieces of Model Magic apart. Have your child smooth them over the front of the cardboard. If you plan on making a mobile, cover the back as well. 4. Color a craft stick with a marker. Your child can add spots, stripes or a face for her fluttering friend. 5. Press the craft stick into the center of the butterfly, making an impression in the Model Magic. Pull the craft stick off, and put it to the side for right now. 6. Paint the butterfly’s wings. The harder that your child presses down into the clay compound, the more texture she’ll create. She can make a solid-colored artwork, add a pattern or use the Model Magic itself to let the brushstrokes show through. 7. Sprinkle glitter over the still-wet paint. 8. Push the craft stick back into the impression. If it doesn’t stay, add a few dots of school glue underneath.